In a sequence of numbers, if every term except the first one has a common relation to the preceding number, then that sequence is called a progression. For example, the sequence 1, 3, 5, 7, . . . n is called a progression because the series has a common relation, i.e., if you add 2 to any term, you get the succeeding number. We denote the terms in the sequence as t1 t2 t3, . . . tn for the first term, second term, third term and so on, and the last term is tn. 2, 4, 6, 8, 10, . . .
4, 7, 10, . . . In each of the above examples, we find an arrangement of numbers in a definite order. Also, the terms follow a certain rule. In the first and second examples, by subtracting 2 we get the preceding number. In the third one, we need to subtract 3. Therefore, an arithmetic progression (A.P.) is a sequence in which each term, except the first, is obtained by adding a fixed number to the term immediately preceding it. The first term is noted as “a”. This fixed number is called the common difference and is usually denoted by “d”. For example, in our example series 1, 3, 5, 7, 9, . . .
Let us consider an A.P. with first term “a” and common difference “d”. The second term is obtained by adding “d” to the first term “a”. Thus, t2 = a + d; similarly, t3 is obtained by adding “d” to t2. Thus, t3 = t2 + d = a + d + d = a + 2d. We see that in any term, the coefficient of d is always one less than the number of terms in the series. 1) Find the 18th and 23rd term and the general term of the A.P. 16, 11, 6, 1, -4, -9. 2) The first term of an A.P. is -2 and the 10th term is 16. Determine the 15th term. t1 = -2 and t10 = 16. So, t15 = a + 14d = -2 + 14(2) = -2 + 28 = 26. Carl Friedrich Gauss, the great German mathematician, was in elementary school. One day, his teacher gave the class a problem of finding the sum of the first 100 natural numbers. While the rest of the class was struggling with the problem, Gauss gave the answer in no time. 1) He wrote the first 100 natural numbers as given below. S denotes the sum to be determined. We now provide a method of finding the sum of n terms of an A.P. Let the first term of an A.P. be “a” and the common difference “d”. Let Sn denote the sum of the first “n” natural numbers. 3) Find the sum of the first 100 natural numbers. 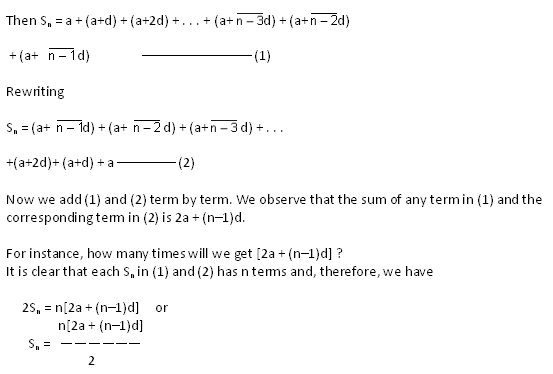 Find d and write the next two terms of the following A.P 21, 25, 29, . . .
10, 17, 24, . . .
0, – 3, – 6, – 9, . . . The sum of three terms of an A.P. is 36 while their product is 1620. Find the A.P. Determine the sum of first 35 terms of an A.P. if t2 = 2 and t7 = 22. Let the first term be “a” and common difference d.
21, 25, 29, . . .
= 3 + 18 = 22. = – 1 – 12 = – 13. = 1 + 20 = 21.